LA PUENTE – When Bassett High School junior Catherine Jaime’s nephew was admitted to a Newborn Intensive Care Unit, she was inspired to join her high school’s Health Occupations of America (HOSA) Club to explore careers in Neonatology. “Watching the nurses take care of my nephew and family, and just watching the way that their work changed lives, it sparked my interest,” Jaime said. Since then, Jaime has discovered a career she is passionate about, been chosen to attend the 2019 California HOSA State Leadership Conference in Sacramento and secured an internship at a local clinic. The 2019 California HOSA State Leadership Conference will start Thursday, March 28 at the Sacramento Convention Center. 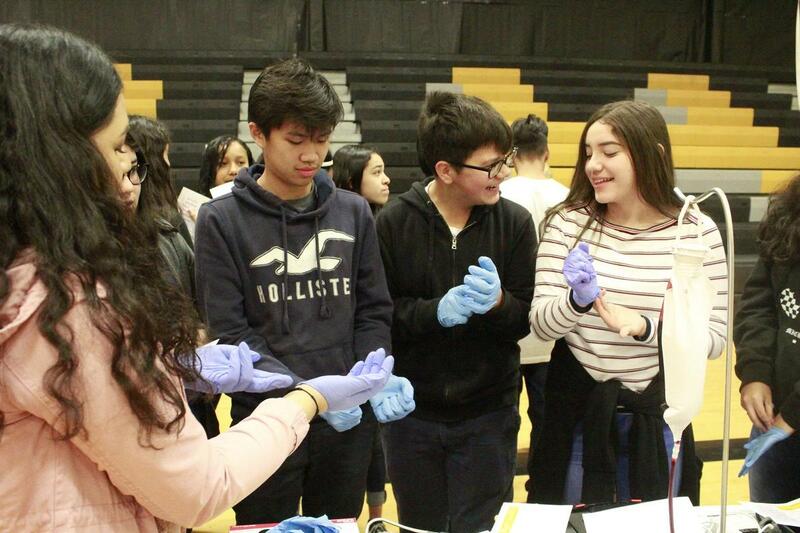 03-27-19_BASSETT_HOSA_2: Bassett High School students who are members of the Health Occupations Students of America Club share their knowledge and passion for health care with Torch Middle School and Edgewood Academy students during the BHS Pathways Showcase Jan. 30 at Bassett High School.